Picking up where the previous series left off, Ultimate Iron Man II is, naturally, the tale of Tony Stark and his development and initial field tests of the Iron Man armor. As is typical of the Ultimate Universe, this take on the character is a little different than the same old story: this Tony is a very young man, trying to make his way out from under his father's long shadow. He needs the suit to be a success, not just for personal satisfaction but in order to have a chance at survival in a ruthless corporate climate. Fortunately, young Stark and his coworkers provide a rich, well-developed cast of characters and author Orson Scott lets them do their thing without much interference. He knows how to establish someone's intelligence without stuffing their dialog full of big words and technical jargon, which is wonderful to see in action. A lot of time a genius' intellect shines twice as brightly in the way they carry themselves during adversity and criticism, and that's where these guys are really in their element. When the government shows an interest in Stark's robotic suits, Tony and his friends aren't intimidated by the men in black, they stand firm under that scrutiny and emerge as stronger individuals because of it. But that doesn't mean they're all business, either. From the few glimpses we get into the suit's development cycle, it's immediately evident that they're all completely and utterly psyched about this project. They can't wait to show off some of the armor's new features, and that gives them a specific emotional attachment to the plot. The writer's placement of this story in the recent past — about 10 years prior to the current events in the Ultimate universe — presents a unique opportunity to enrich and broaden characters who have already appeared in other titles within the universe. Dr. Molekevic for example, from early Ultimate Fantastic Four continuity, is a prominent member of Stark's staff. He's still years from becoming an evil, villainous mastermind, but even now, the seeds are being planted for his eventual turn. It's that attention to detail and the big picture that's helps shift this book from just another re-imagined heavy hitter to something worth taking note of. Pasqual Ferry's artwork is gorgeous throughout the issue, showing hints of Bill Sienkiewicz in his simplified, yet complicated character models and touches of Moebius with his fantastic techno-organic backgrounds and environments. He keeps the pages surprisingly clean and legible without sacrificing any detail or flair. 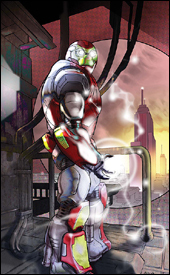 In a series that's primarily focused on a robotic suit of armor, both of those tendencies can be lifesavers. By sketching a detailed, seemingly lifelike representation of the Iron Man armor, he gains some credibility by helping readers suspend their disbelief a bit. But, at the same time, by keeping the page clear of debris he saves the layout from feeling too weighty and complicated. This is a book that's beautifully authentic, but also easy to follow. My primary complaint was that I had trouble accepting the lead character as Tony Stark, at least visually. Where I'm used to Tony as the mature, suave, middle-aged inventor, here he looks unusually young and unproven. That's not something I can fault the artist for, since this is written as a flashback tale, and in that respect the story also works very well, so I can't blame the writer. Still, it's something that bothered me — like watching a famous role played by a new actor. Even though Pierce Brosnan made a fine James Bond, there were plenty of moments in Goldeneye where I had to keep reminding myself who he was supposed to be portraying. The motions are right, the personality is there, but it just doesn't seem like it's the same character because I'm so used to seeing him in a certain way. As somebody who didn't read a word of the first series, I found Ultimate Iron Man II very easy to climb into and immediately understandable. The bulky "previously in" blurb is somewhat imposing and lengthier than it really needs to be, but even if you're the kind of reader who skips that stuff, you won't feel lost or overwhelmed. A sharp, entertaining story and some very good artwork make this one a buy in my opinion.